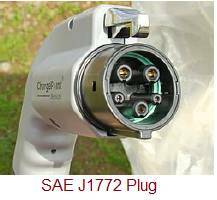 This page describes SAE J1772 plug used as connector in Electric Vehicle (EV) charging. SAE J1772 Plug pin diagram and J1772 Signaling Circuit are also covered. SAE (Society of Automotive Engineers) J1772 is conductive charge coupler. It is used as single phase AC charger connector for electric vehicles. On EV (Electric Vehicle) side, US and Japan have converged to J1772 plug. This EV plug is used by automakers such as GM, Ford, Honda, Mitsibishi,Chrysler, Tesla, Toyota, Renault-Nissan etc. Figure-1 depicts J1772 plug pin diagram. Following table-1 describes signals shown on J1772 plug pins. 4 Control Pilot 1 KHz square wave at +/-12V is generated by EVSE (Electric Vehicle Supply Equipment) on the pilot pin to detect the presence of the vehicle, communicate the maximum allowable charging current and control the charging begin/end. 5 Proximity Detection It is used to prevent movement of the car while connected to the charger i.e. EVSE (or charging station). There are two EV side connectors viz. type-1 and type-2. ➨Type-1 connector (i.e. J1772): It consists of 5 pins. It has charging voltage upto 250V and charging current upto 32 A. Hence AC charging power upto 7 KW can be possible. ➨Type-2 connector: Initially proposed by Mennekes. It supports single phase charging and three phase charging with charging voltage upto 500V and charging current upto 63A. Three phase 400 V charging at 32 A represents charging power of 22 KW. Figure-2 depicts J1772 Signaling Circuit.